Rendering of the massive Toronto Muji flagship set to open this fall, provided by Muji. MUJI Goes Big in Canada for Fall/Winter 2018: Minimalist Japanese retailer Muji continues to grow its presence in Canada as it expands two of its stores to become significant flagship locations. Last week, Muji unveiled its expanded Metropolis at Metrotown store, which grew by more than 50% to span 12,305 square feet on one level. Only the Robson Street flagship in Vancouver is larger, measuring 14,507-square-feet, according to the company. In Toronto as well, Muji is preparing to open its largest store outside of Asia at The Atrium complex on Dundas Street West near Yonge Street. A temporary location will close on October 29 and when the new one opens late fall, it will span a whopping 19,110-square-feet over two levels. It will be the first two-level Muji in Canada and will feature a central escalator well. Brokerage CBRE has been involved with MUJI's negotiations across Canada, led by Arlin Markowitz, Senior Vice President of CBRE's Downtown Toronto Urban Retail Team. CBRE Vancouver's office, including Martin Moriarty and Mario Negris, were involved in the Metrotown/other Vancouver-area deals. 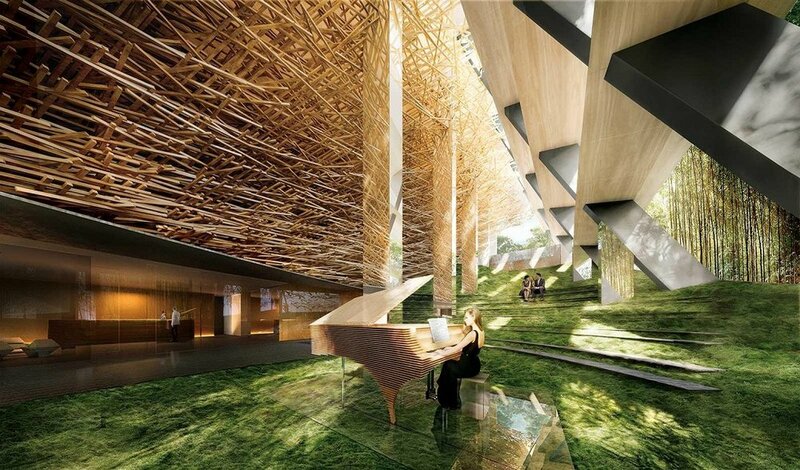 Oakridge & QuadReal To Launch Exhibition with Kengo Kuma Fazioli: In mid-November, QuadReal Property Group will unveil the next step of the Oakridge Centre transformation. The Westbank Exhibition Centre will be assembled and housed in the former Zellers location and will feature a series of installations, which will culminate with the unveiling of a Kengo Kuma designed Fazioli piano commissioned through Showcase Pianos. The world-renowned Japanese architect designed the case which was built of Hinoki Wood over a one year period and comes with a price tag of $890,000. Currently dismantled and residing in the Showcase Piano’s warehouse in a series of boxes, owner Manual Bernaschek will oversee the assembly of the piano at the location. After the exhibition space is closed, the Fazioli will be moved to the lobby of the ‘Kengo Kuma’ building which is under construction at 1550 Alberni Street. The exhibition is part of the transformation of Oakridge Centre, which is a 574,000-square-foot shopping centre, which sits on 28 acres of land in the heart of Vancouver’s affluent West Side. It will be transformed into a major 4.5-million-square-foot hub of retail, residential, workspace, parks, and civic space. Included will be a massive community centre, public library, performance facility, dance academy, daycare, 100,000-square-feet of curated culinary experiences and an approximately nine-acre park — as well as office space and residential towers that will house about 6,000 people in more than 2,600 homes. Oakridge will anchor an up-zoned neighbourhood that is projected to grow by more than 50,000 people within a kilometre radius over the next two decades. QuadReal partnered with Westbank Corp. and together have engaged Henriquez Partners Architects, Tokyo-based interior design firm Wonderwall, and other design partners for this initiative that will be a model for future high-density retail mixed-use redevelopments globally. Boucheron Parters with Holt Renfrew on Vancouver Pop-Up: Paris-based luxury jeweller Boucheron has popped-up at Holt Renfrew’s mega-productive Vancouver flagship at CF Pacific Centre. Boucheron could end up with a permanent presence at Holt’s if things work out as planned. It is also on display at the Yorkdale store in Toronto. A source in the industry said that Holt Renfrew has an established budget of $5-million for Boucheron jewellery and will carry several millions more worth of “exceptional jewellery pieces in trunk shows across its top stores in Canada”. If Holt’s sells enough over the eight-month window, Boucheron could end up opening at least one standalone boutique in Canada, according to the source. 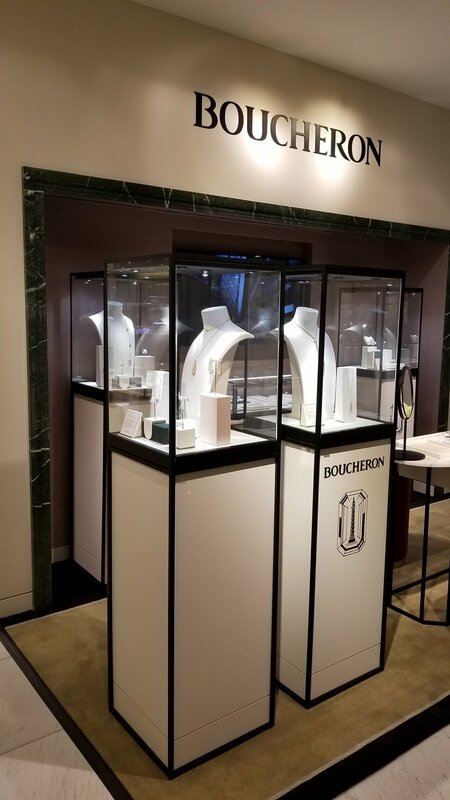 Boucheron has limited distribution in Canada and in Toronto, Saks Fifth Avenue houses a Boucheron shop-in-store at its flagship CF Toronto Eaton Centre store. Product is sparse on the quiet sales floor which houses other luxury jewellery brands such as Piaget and De Grisogono. The tiny Vancouver Boucheron boutique is located on the store’s ground floor accessory hall, which is said to do astronomical sales numbers in its shop-in-store and concession environment. Vancouver’s Holt Renfrew is said to be selling about $400-million annually in its 188,000-square-foot space anchoring the north end of CF Pacific Centre. 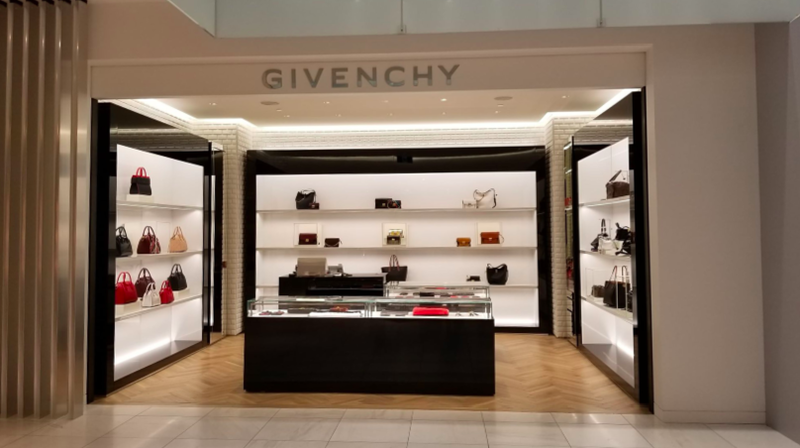 Holt’s Vancouver store also recently launched a Givenchy shop-in-store and this fall, a Valentino accessory ‘hard shop’ will be opening as well — a first for Holts. Valentino ‘hard shops’ are also located at Nordstrom in Vancouver and Toronto (Yorkdale) as well as at Saks in downtown Toronto. In several weeks, Valentino’s first standalone store in Canada will open at Toronto’s Yorkdale Shopping Centre. The two photos below (Valentino and Givenchy) and the top image of Boucheron were taken by Helen Siwak last week. WAXON Taps Laser Technology and Relaunches as WAXON Laser + Waxbar: After a year of planning and raising capital WAXON Laser + Waxbar, has added laser services at all 13 of their Canadian locations. With the introduction of Vectus Laser machines and providing state-of-the-art technician training for staff, WAXON now offers fast, convenient and pain-free permanent hair removal solutions for all skin and hair types in under 10 minutes a session. In September 2018, MarketsAndMarkets Inc. reported that by 2023 the medical aesthetic market internationally would be worth 17.07 billion dollars. The transition from manual beauty services to technology-assisted offerings is how small business like WAXON will stay competitive in the increasingly lucrative beauty business. The use of the laser provides clients with high volume permanent hair reduction in fewer sessions, saving time and cost. Each Vectus Laser comes with Skintel technology that reads skin melanin levels, which allows technicians to tailor the treatment to each client’s needs, achieving effective results on average within just four to six sessions. In addition to single service pricing and interest-free financing options for laser treatments, WAXON provides flexible BAR TAB packages for both waxing and laser, giving the brand an additional edge in the hair removal industry. Cashmere Collection Celebrates 15 Years of BT Couture for Breast Cancer: The 15th annual Cashmere Collection fund- and awareness-raiser for the breast cancer cause showcased Canadian designers with a theme of ‘crystal.’ This year’s collection was curated by Canada’s own Mosha Lundstrom Halbert; the New York-based internationally recognized fashion director, editor, writer, and stylist. Hosted by CTV News Anchor and breast cancer survivor Beverly Thompson with Toronto diamond jeweler Kimberfire generously donating more than 60,000 crystals to make this year’s collection sparkle, the audience of more than 200 Canadian fashion industry leaders, influencers, designers and media turned out for this eagerly anticipated annual runway debut. Produced by Kruger Products, the maker of Cashmere Bathroom Tissue, the collection is a heartfelt display of the brand’s commitment to nurturing Canada’s fashion industry while inspiring citizens to support and contribute to the breast cancer cause. Wardrobe Apparel Joins Haberdasher & Co in Classy Colo: Gastown’s Wardrobe Apparel has moved to Yaletown, colocating in a 1600-square-foot space with men’s wear company Haberdasher & Co, with an official launch event planned for November 1, 2018. The space boasts floor-to-ceiling windows, beautiful hardwood floors, and luxe furniture. Wardrobe Apparel focuses on clothing that is custom curated and personally styled for the well-travelled career woman, and Haberdasher & Co. offers a world-class custom suit program with a wide array of premium fabrics and details to make suits unique to each man. Both business owners Alexandra Thompson (Wardrobe Apparel) and Bobbie Long (Haberdasher & Co) have developed, and maintain a VIP feel to their businesses, through appointment only fittings and custom orders with hand-selected designers and materials. Wardrobe Apparel custom curates from top brands such as Canadian luxury designers Greta Constantine, award-winning London jeweler Imogen Belfield, and costume jeweler to the stars Alan Anderson, and much more. While Haberdasher & Co. curates Canadian made clothing from companies such as Coppley, and Paul Betenly. Walmart Supercentre Takes Over Target Space at Burnaby’s Metropolis at Metrotown: Officially opened earlier this month, the new Walmart Supercentre occupies 2-floors and 118,000-square-feet in Metropolis at Metrotown in the space formerly occupied by Target in the east wing on ground level. This is the latest of the now 20 stores now open across the Lower Mainland with the location easily accessible by vehicle and by foot via the Metrotown sky train station. On the ground level first floor - accessible from the mall entrance and Central Boulevard – shoppers can find groceries and fresh produce, home supplies, and seasonal items. The second floor is accessible by escalators/elevator and is dedicated to bath and decor, clothing and footwear, entertainment, baby products and toys, and health and beauty. Walmart has also donated $6,000 to local community groups, including Heart & Stroke Foundation of Canada, Burnaby Neighbourhood House, The Greater Vancouver Food Bank, and Boys & Girls Clubs of South Coast BC. Hey Archive! Launches Vancouver’s First Consignment Warehouse Sale: The first week of November will be exciting for those on the west coast with an interest in sustainability, especially in fashion. Randa Salloum (CIEL Creative Marketing) has partnered with Kelly Turner of Fall for Local Markets to create the city’s first and largest consignment warehouse sale - ARCHIVE to be held at WerkLab facility on Venables Street. Different from a market, which is defined by a vendor/kiosk arrangement, all pieces for ARCHIVE will be tagged and hung together in style categories for easier shopping by attendees. Salloum, a well-known lifestyle influencer in marketing/PR, decided to partner with Turner in an attempt to access the thriving west coast market community to expose Vancouverites to a fun way to get involved in sustainable fashion and the circular economy of textiles. On Friday, November 2nd, ticketholders are invited to ‘rethink retail’ at an evening event which includes a Vancity Credit Union moderated Shopping & Sustainability Panel with local bloggers and slow fashion advocates Elim Chu, Tijana Popovic, Laila Potvin, and Helen Siwak, with the opportunity to advance shop, and network. Saturday, November 3rd from 10 am to 5 pm the public will converge on WerkLab to buy women’s and men’s apparel and accessories ranging from contemporary - think Aritzia and Lululemon - to designer luxury brands like Gucci, Jimmy Choo, and Dior. Using edgy marketing techniques and social media to attract interest, the event capped consignor participants at 20 persons bringing over 1,000 items, plus two local retailers, and a special guest from an international luxury brand who will be selling from their personal collection. J. Crew Closes More Canadian Stores: The future of US fashion brand J.Crew in Canada is in question after it recently closed its CF Chinook Centre store in Calgary recently. The brand has closed several Canadian locations over the past couple of years in Toronto (CF Fairview and CF Markville) and at West Edmonton Mall, and sources are saying more closures are to come. The brand is struggling south of the border, though it’s seeing some attention with news reports of celebs such as Megan Markle wearing the brand. Nevertheless, J. Crew terminated its Canadian PR contract last year and other retailers are said to be eyeing its valuable real estate — if there’s one thing J. Crew did well, it picked great retail spaces in malls and on high streets. Rumours persist that Canada Goose is looking at J. Crew’s CF Toronto Eaton Centre location, for example. J. Crew still operates a network of full-priced stores as well as outlets in Canada, at least for now.